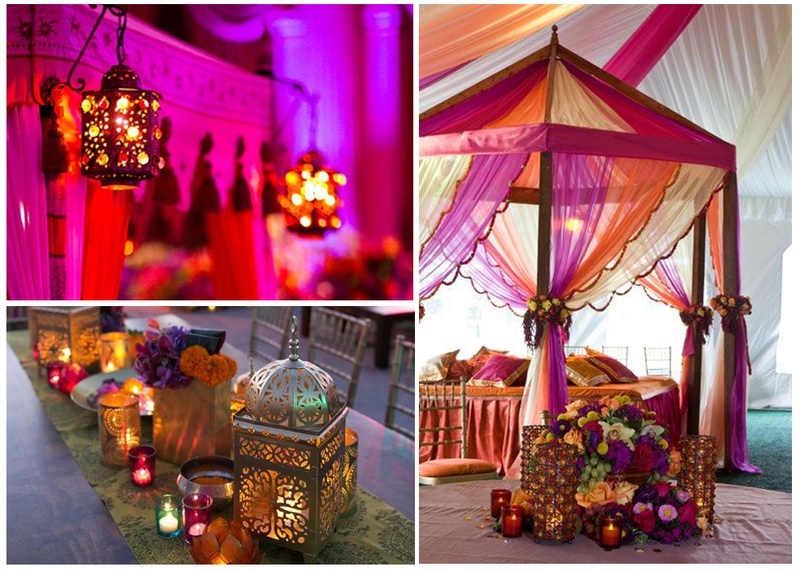 Would you try these Moroccan Wedding Decoration Ideas at your Indian Wedding? Modern brides are continually looking for ways they can make their Indian wedding decoration stand out, from incorporating themes from the west, inclusion of bridal bouquets, table settings and more to making sure their décor is also personalized to the T. Hence, we bring to you a new (and rather easy) trend to incorporate into your Indian wedding! Moroccan weddings can be defined as an amalgamation of Christian weddings and desi weddings. Their use of colourful lamps, drapes beautifully hung in vibrant colours, gaddi and cushions used for seating – a large chunk of the theme and feel of Moroccan weddings vibe with Indian ones. While being completely in love with our desh ki mitti, we thought, why not incorporate styles and techniques from Moroccan weddings and adapt them into our Indian wedding decoration! You need not turn your whole wedding into a colourful, vibrant Indie-Moroccan wedding, but adding elements from that style will definitely spruce up your Indian wedding decoration! What we’ve learnt studying these photos is how their wedding décor ideas are all about the detail. Whether it’s their lamps, cushions or even their wedding favors – detail here, is key. We thus bring to you a breakdown of how you can incorporate little elements of this gorg wedding theme into your own. Stick to this game and we guarantee you’ll be pulling off that Moroccan vibe perfectly! Elements you need to incorporate in making your wedding invitation "Moroccanized" - Lazer-cut, mehndi designs and beautiful ethnic prints. This is one aspect where you can get super creative! Cusions disgused as cake, elephant as cake even Aladdin's magic lamp as one - nothing is too difficult for culinary cake experts we say! Intricately cut wroght-iron lamps, glassware and candles - throw in some of your favorite flowers and you have table centrepieces that will be instagram-worthy for eons to come! That is absolutely right. Chairs. Chairs play such a huge role in setting the vibe of your evening. Whether they're banquet chairs for a formal setting. or chivaris for an outdoor open-air theme, wedding chairs, we think are an underrated yet very important part of Indian wedding decoration. Make a superb first impression by using these wedding entrance decor ideas for your Indian wedding! Here, curtain styled drapes in multiple colours are your best friend. Put in the right amount of fairy lights and lamps to create a magical wedding entrance. While the cuisine you serve at your wedding might be Indian, the way the food is presented need not be traditional. Take cues from the following pictures on how to jazz up the food corner at your Indian wedding the Moroccan way! 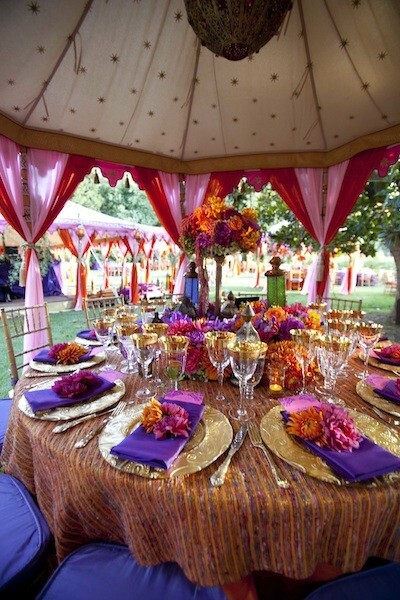 Bring out the vibe of your moroccan-desi wedding with these vibrant table settings full of little details. Adding flowers, lamps and glassware only make the dinner table even more gorg. Give-away something equally gorg to your wedding guests - something to remember your Indie-Moroccan wedding by!